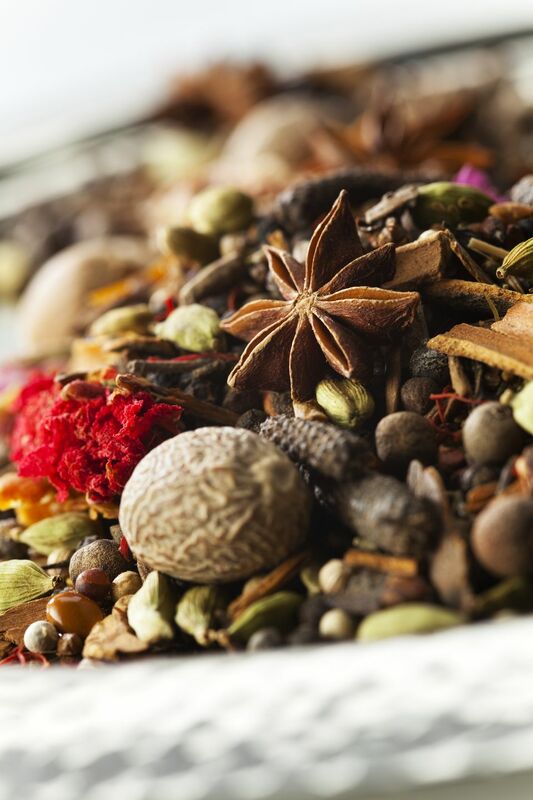 Morocco's famous Ras el Hanout is one of the most sought-after spice blends associated with an ethnic cuisine. It would lead you to believe that it's an everyday seasoning in Moroccan homes, but in actuality, many home cooks use it in only a handful of very traditional dishes such as Rfissa, Mrouzia and Couscous Tfaya. That shouldn't stop you from experimenting with it, though, so go ahead and use a little wherever you want to add a complex, aromatic nuance to Moroccan dishes or kefta. It works well, for example, in tagines with carrots and dried fruits, sweet and savory combos and with some grilled meats and poultry, and in many soups. Moroccan Recipes with Ras El Hanout will give you some more ideas. The Arabic name ras el hanout translates literally to "head of the shop," a reference to the spice blend's status of being the very best of what a spice vendor has to offer. Traditionally the mix has a lengthy list of ingredients which is unique from one spice shop ( to another. The number of spices can reach 30 or more. This recipe, adapted from one by Moroccan television chef Choumicha, originally had 22 ingredients; I've added star anise and mace. You'll also find versions with dried caper, lavender, cumin, fenugreek and more. If you can't find some of the ingredients, simply omit them and make your blend with as many of the spices as you can find. As with other authentic Ras el Hanout recipes, this one calls for whole spices which you'll grind yourself. (Compare online prices for spice grinders.) It makes a very generous quantity, so you may want to reduce it by half, or plan to make the whole batch and give some of the mixes away as a gift. Another option is to crush coarsely and combine the ingredients, then store. When needed, you can toast the necessary quantity in a dry skillet and then blend. For a quicker, easier recipe that uses only a few ground spices which you may already have on hand, try this Simplified Ras El Hanout Recipe. Or, you can save yourself the work and buy Ras El Hanout online. Preheat your oven to 338 F (170 C). Place the turmeric root, ginger root, and galanga root on a baking sheet and toast in the preheated oven for 15 minutes. Remove the pan from the oven and set aside. Slightly reduce the oven temperature to 325 F (160 C). Arrange the remaining spices (except for the nutmeg and saffron) on a rimmed baking sheet and place in the oven for 10 minutes. Remove and set aside. Use a mortar and pestle to crush the turmeric and ginger. Transfer the crushed rhizomes to a bowl and add the other toasted spices. Stir to mix, then grind finely (in batches, if necessary) in a spice grinder. Sift the ground spices into a medium sized bowl and discard any residual matter in the sifter. Add the saffron and nutmeg and stir to combine. Store the spice mixture in an airtight metal or glass container away from sunlight.